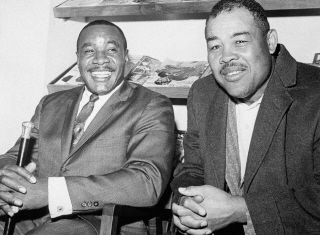 Joe Louis and Sonny Liston have to be considered two of the greatest boxer-punchers in heavyweight history. Another thing which draws Louis and Liston together is, they were good friends while Liston was working his way up the Heavyweight ladder on his way to the title. Liston idolized Louis and handed Joe cash during the sixties when they both lived in Las Vegas. At one time the debate used to be between Louis and Dempsey as to who was the greatest Heavyweight Champ of all time. Then it was between Louis and Rocky Marciano. Enter Sonny Liston of the late 1950's and early 1960's. Yep, in the early 60's there were many respected boxing minds who thought that Liston was even greater than Louis was. It was assumed that Liston was the new breed Heavyweight who was even bigger and stronger than Louis. Sort of like what we hear about today's Heavyweights. Just as it's the wrong perception today, it was the wrong perception then. Since Liston's upset loss to Muhammad Ali aka Cassius Clay in 1964, no one ranks Liston above Louis any longer. Although Liston is still highly regarded in the annals of heavyweight history. Louis and Liston were two big strong heavyweight's who could really punch. They both had devastating left jabs, along with having KO power in their left hook and right hands. When it came to throwing the uppercut, both Joe and Sonny were at the head of the class. However, there were some noticeable differences between them. Louis owned the faster hands and was the better combination puncher. Louis was also the most faultless fighter in history as a technician regardless of weight division, he was picture perfect. Liston was best known for his long powerful left jab which is considered to be one of the best ever seen in the Heavyweight division. Both fighters were capable of cutting off the ring and both were very good boxers. Not the typical walk in brawlers that some associate big punchers as being. 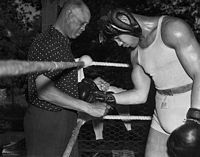 Joe Louis took the heavyweight division by storm after turning pro in 1934. On the way up to winning the title, Louis fought four former heavyweight champions and defeated three of them. His only loss was to Max Schmeling who stopped him in 12 rounds. Almost one year to the day after losing to Schmeling, Louis knocked out James Braddock to win the heavyweight championship of the world. After making three defenses of the title, Louis faced Schmeling in a rematch that was the most highly anticipated fight in history at the time. The fight was no contest as Louis pulverized Schmeling in just over two minutes. For the better part of the next 11 years Louis creamed the worlds best heavyweights. Louis would go onto make a record 25 successful title defenses. A record that still stands today for any champion in any weight division. Louis retired Champion in 1949. Two years later Louis came out of retirement due to financial reasons and fought the man who succeeded him as champ, Ezzard Charles. Louis was a shell of him self that night and lost a lopsided decision. Thirteen months later Louis faced future champ Rocky Marciano and was stopped in the eighth round. Shortly after losing to Marciano Louis retired for good. At the time of Louis' retirement, he was regarded by many as being the greatest Heavyweight Champ of all time, something many still believe over 50 years later. Charles "Sonny" Liston took up boxing in prison. When Liston was paroled in 1952 for armed robbery he started fighting competitively as an amateur. In 1953 he won the national golden gloves. Sonny turned pro in late 1953 and won his first 7 fights before losing a decision to Marty Marshall in his 8th fight, a fight he suffered a broken jaw in. Liston fought Marshall two more times stopping him and decisioning him. After doing a couple more Prison stints over the next few years Liston was the top ranked and most feared Heavyweight in the World by 1958. For the next four years Liston was avoided by heavyweight champ Floyd Patterson. During that time Liston was going through all the top heavyweights who Patterson's management team kept him away from. After chasing Patterson for four years, they finally met in September of 1962. After two minutes of the first round Liston did to Patterson what many thought was inevitable, destroyed him and took his title. Ten months later Liston defended the title against Patterson and needed only two more seconds to repeat his title winning effort over him. Seven months later Sonny would lose the title to Cassius Clay as a 7-1 favorite. In the rematch 15 months later Clay who would become Muhammad Ali defeated Liston again. After losing to Ali, Liston would fight for five more years going 15-1 (14). His lone loss would be a KO defeat to contender Leotis Martin in his next to last fight. Seven months after defeating Chuck Wepner in his last fight, Liston was found dead in his Las Vegas home due to a drug overdose. The lost to Ali tarnished Liston's legacy forever as an all-time Heavyweight great. However, his skill and fighting ability will never be in question. A Louis versus Liston match up is an interesting fight to try and imagine. I'm sure many believe that it's all Louis and Liston has no shot. No doubt Louis has to be favored, but a Liston win shouldn't be considered a big upset. Assuming Joe and Sonny are at their absolute best, it's a close call. The thing that makes this hypothetical fight interesting is that neither fighter came close to fighting a fighter close to either one of them. How would Louis have coped with Liston's jab? How would Liston off set Louis' combination punching and hand speed? 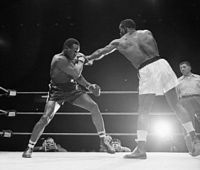 As good as Liston was offensively with his dynamite jab and left hook, Louis had a jab, left hook, and a devastating right hand. That is where the biggest difference is between Louis and Liston. Along with having faster hands and being a better combination puncher, Louis had the better right hand. Louis gets the nod offensively. When it comes to defense, it's pretty close. Louis parried and blocked punches with his jab. Liston relied more on head and upper body side to side movement. Both were stalkers but weren't pressure fighters like Marciano and Frazier. Although Louis and Liston both pursued, they didn't come in with the speed and tenacity as Marciano or Frazier. Defensively it's pretty close, neither were easy to hit, and only fast footed boxers found them with any type of consistency. As to who took a better punch, this is also pretty close. 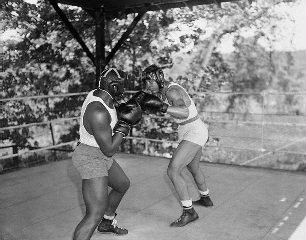 Louis was only stopped by Schmeling on the way up who hit him with a barrage of big right hands over 12 rounds, and by Marciano when he was an empty package at age 37. Although Louis was down ten times, only Schmeling and Marciano hurt him badly. Any other time he went down, it was a flash knockdown and he got right up. Liston was only down and counted out twice. Once by Muhammad Ali and once by Leotis Martin when he was nearly forty years old. In the fight with Ali, he was never given a count by referee Jersey Joe Walcott, and he was on his feet fighting when the fight ended. In the fight with Martin, Liston was poleaxed by a thunderous right hand and was counted out. Again, he was a shot fighter by then. In my opinion the chin match up is a close call, but if forced to pick one, I'd pick Liston. If Joe Louis and Sonny Liston met on their best night, I'd have to pick Louis. I believe Louis may have been a little vulnerable to Liston early, and may have been a little busted up by his jab? But when all is said and done, I think Louis's hand speed and combination punching would've most likely been the difference. Joe had the height and reach to neutralize Liston, enabling him to utilize his greater speed and boxing ability. Louis wins a decision over Liston, with an outside shot at stopping him if he tires or slows down. However, I don't think a Liston win should be totally discounted. That being said, once again the pick here is Louis over Liston. This article 1st appeared at Eastside Boxing on July 19, 2004 and appears at Cox's Corner with permission of the author.